Machi Zawidzki is an architect with a master's degree in architecture and city planning. Presently he is doing Ph.D. research on daylight design at the Institute of Fundamental Technological Research at the Polish Academy of Sciences. His aim is to create a kind of architecture that can be classified as "radical pragmatism." This means replacing pseudo-creative arbitrary decisions by solving multi-layer problems of building such as interior comfort, daylight, acoustic and thermal conditions, energy consumption, etc. He also believes that this requires application of modern computation tools, namely "soft computing." The aim of my research is to use cellular automata in architecture. Shading is a good area for such implementation, since shading devices are often composed of array of elements that change their configuration to block out the light, usually from the sun. CA shading systems are visually attractive, simple, and modular. The visual attractiveness comes from the following facts: CA-based shading devices are new, they behave in "organic" ways, they follow a non-trivial pattern that is perceptible, and their pattern can be partially controlled by modifying the initial conditions. 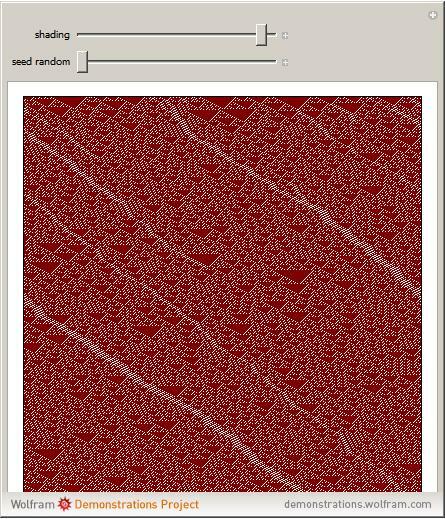 The project focuses on finding and controlling cellular automata that can reproduce a wide range of dithering. I excluded CAs that produce simple repetitions. My ultimate aim is to deliver a physical object that will model considered shading device.